This is the eleventh book of the Coffee House Mysteries. I can see why the series keeps going and the readers keep reading! Clare owns a coffee house in New York, complete with a Muffin Muse truck to carry her tasty treats throughout the city. Coyle knows the streets, the signs, the traffic, and the people who live in New York, so it feels like you’re right there with Clare. Too bad Clare’s boyfriend, Mike, is out of town on a special assignment when the dastardly deed is committed. She could’ve used his shoulder after her friend and colleague, Lilly, gets run over by a white van which might be under the ownership of Clare’s biggest competition. Without Mike’s help, Clare ops for her team at the coffee house to figure out who and why Lilly was run over. Clare construes a plan to find the van and believes she’s on target with catching the bad guy. Too bad the police are better at solving mysteries and have to keep turning Clare in other directions. She still doesn’t feel she’s wasted a bit of time when it comes to helping her friend. The end result, along with a hefty dose of Mike, calms Clare and returns her to her main focus, the coffee house. 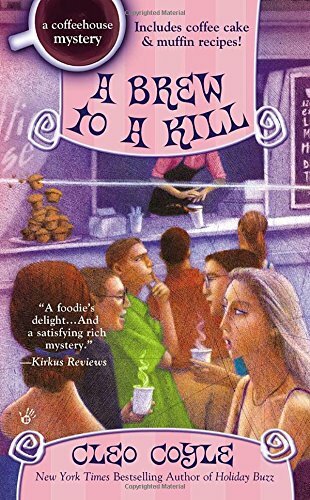 It’s a fun and ever-changing route Clare takes her readers on, so if you’re in the mood for something light and enticing, pick up A Brew to a Kill! EDEN DISCOVERED Released and a Mask Giveaway!